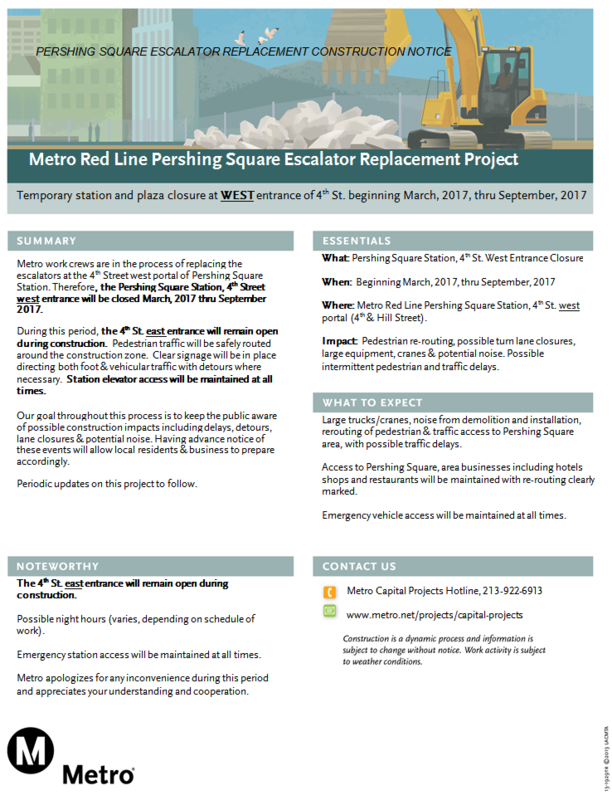 The 4th Street west portal of Pershing Square Station will be closed March through September 2017 so crews can replace the escalators. The 4th Street east entrance will remain open during construction. Elevator access will be maintained at all times. See construction notice below for more details. Im wondering if Metro is going to complete the canopies. Originally it was proposed as shelter for the escalators, but only a few went up. What happened? Are crews also going to replace the east Pershing Square 4th St. entrance? That entrance has to be one of the ugliest “cubes” ever built. Not to mention it floods in the most minor of rain showers and its bare white walls are a magnet for graffiti. That area is under development by the adjacent property owner, so it may look quite different in a few years. I don’t know if that entrance covering is only temporary through construction, but ultimately the plaza surrounding the east entrance will lead into the mixed-use Broadway Tower, which is supposed to be completed in 2020. Wonderful news, thanks for the reply!